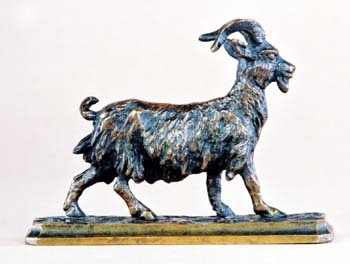 Very early in his sculpture career Christophe Fratin modeled and had cast small bronzes of domestic animals. These "barn yard" sculptures consisted of cattle, pigs, and goats, as well as other farm animals that were a part of every day life in the early 19th century. These small models are quite rare today. 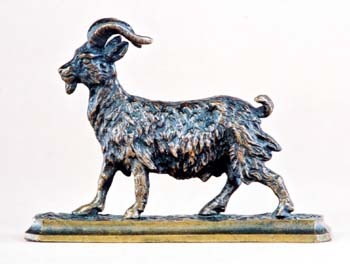 This very early cabinet bronze of a Goat is expertly modeled and cast. The bronze miniature which is smaller than 3 inches in height shows Fratin to the best of his abilities. He has captured the shaggy fur and sharp hooves perfectly. It is finished in a deep brown patina.